Dogs can do a lot more than fetch sticks and roll in the mud. In fact, there are some dogs that are put to work. They help their owner with a wide variety of tasks, significantly improving life for them. They’re known as service dogs. German Shepherds are one of the most popular choices as service dogs for the blind, physically handicapped, and those in need of a medical alert dog. Keep reading to find out more about German Shepherd service dogs, how to train them, and how to get one if you need one. Can German Shepherds be Service Dogs? With What Conditions Can German Shepherds Help? How Much Does a German Shepherd Service Dog Cost? What is a Service Dog Vest and How do I Get One? 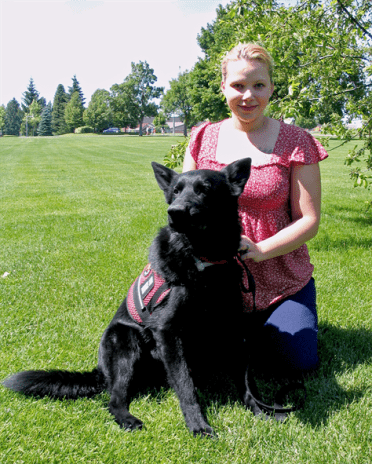 Why Choose a German Shepherd as a Service Dog? Yes, they can. However, there are specific services that these dogs are well-suited for, and others that they aren’t. In general, German Shepherds work best as physical assistance dogs. They don’t do well when anxiety, PTSD, or other similar disorders are involved. This is because they are naturally protective and may end up becoming aggressive when there isn’t a real threat because their owner is nervous. Service dogs have to have a certain set of characteristics so they can do their job. Obedient. 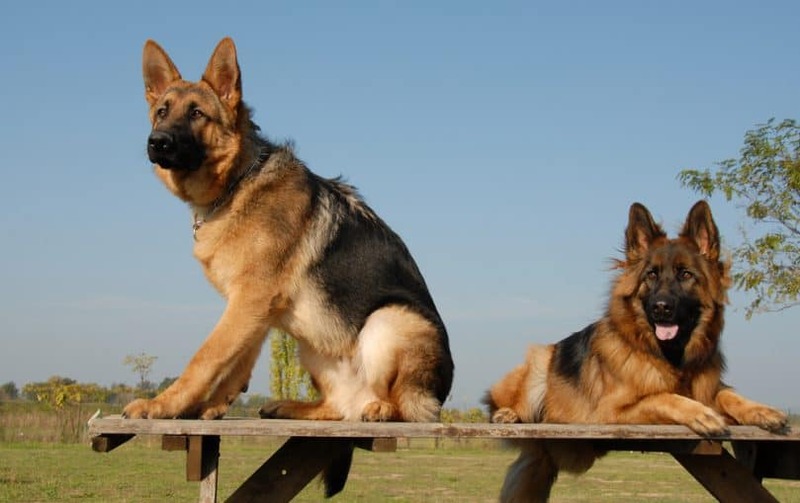 German Shepherds were bred to follow any command given to them without hesitation. Strong. This is particularly helpful for physical disabilities where a person may need to use the dog to help maneuver themselves. German Shepherds are large enough that they can physically help as needed. Good sense of smell. For some service dog roles, a dog needs to be able to detect certain odors and alert their owner of them. Active. German Shepherds love to keep busy so they’ll always be ready to work. However, they’re not so energetic that they require extra exercise. Just being with their owner throughout the day is usually enough for them. Hardworking. This breed is eager to please their owner and puts their best paw forward so they always get the job done. Friendly. Suspicious of strangers but trusting anyone their owner trusts, these dogs do well in social situations. Protective. 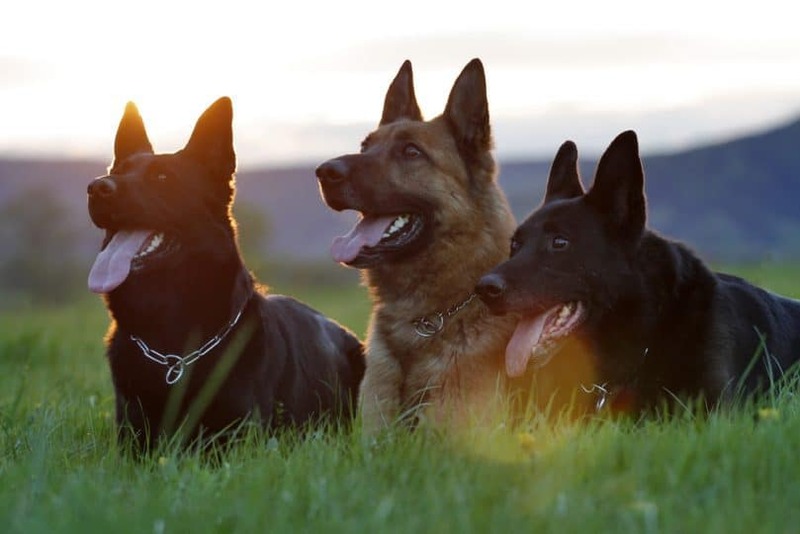 German Shepherds have been known to go as far as putting their lives in danger to protect their owners. Their protective instincts make them excellent guard dogs and will ensure their owner stays safe. Service dogs are typically trained to work with people that have one specific disability, though there are some that are provided with more general training if they work with multiple people. These dogs help people that are physically handicapped to live a more normal life. They provide assistance in getting around, picking up objects, turning off lights, and many other everyday tasks that may be difficult or impossible for their owner. German Shepherds are particularly well-suited for this type of work. Because they are intelligent, they can learn to do a wide variety of tasks, and they are also large enough to help support their owners physically. Psychiatric service dogs are trained to help those with mental disorders including anxiety, depression, and PTSD. They provide a lot more than emotional support as they can identify everything from hallucinations to panic attacks and are ready to intervene. While there are some German Shepherds who can do this type of work, their tendency to follow their owner’s lead can get them into trouble. For example, a person who experiences anxiety when approached by strangers could unintentionally trigger aggression in their dog. This is because the dog sees the stranger as a threat since they’re making their owner nervous. These dogs are generally not as highly-trained as the others on the list are, but they’re no less important to their owners. There aren’t any specific tasks that they are expected to help with beyond proving their owners with love and companionship. Much like with psychiatric service dogs, German Shepherds don’t always do well as an emotional support animal. Their protective nature can turn into aggression against people who are unknowingly causing anxiety. These dogs have to have a strong sense of smell. They alert their handler when their blood sugar level rapidly rises or falls based on the scent of their breath. Then, the individual can take immediate action to solve the problem before it gets worse. Many veterans struggle with adjusting to life after serving their country. 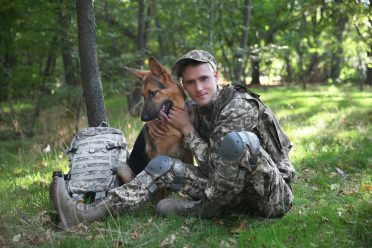 Service dogs provide companionship to these veterans and help with daily tasks that may now be difficult. These dogs may do a variety of jobs that both mobility and emotional support dogs do. Because of the emotional aspect that many veterans need, it takes a special canine to do this type of work. So, not all German Shepherds will be able to do this job. Calmer breeds like Labradors and Golden Retrievers typically do best in this role. German Shepherd can alert their owner of an oncoming epileptic seizure so they can get themselves to a safe location. The dog will then stay nearby to help keep them from injury during the attack and can also bring things like medications or a phone to call for help if needed. Like bomb- and drug-sniffing dogs, allergy alert service dogs are trained to alert their owner when they detect the scent of a certain allergen. They may also wear a special vest containing medication for their owner. As German Shepherds have a good sense of smell, it makes them great allergy alert service dogs. People with cerebral palsy and other similar mobility disorders may need some extra help getting around. Service dogs help provide a counterbalance for them. They also perform tasks like opening and closing doors. A 55-pound German Shepherd is tall and strong enough to provide this service to people up to 130 pounds. For anyone larger than that, you’ll need to find a heavier German Shepherd or choose a larger breed such as a Newfoundland or a St. Bernard. It’s also important that these dogs not have any hip dysplasia or other problems that would prevent them from doing their job. Mobility support dogs don’t typically begin working until at least 2 years of age to ensure that their bones and joints have finished forming properly. Also known as seeing-eye dogs, these dogs are trained to help visually-impaired individuals safely navigate the world. They may also help with other tasks such as bringing items to their owner. The world is unfortunately not designed for people in wheelchairs which makes it difficult for them to do many everyday things. That’s where a service dog comes in. They can pick up items their owner has dropped, reach things like light switches, and perform many other tasks. For handlers with hearing problems, their dog alerts them to different sounds such as the doorbell, a ringing phone, alarms, or a crying baby. They can then lead their owner to the source if they need to take action. The cost of these dogs differs and depends on how they were trained and what they were trained for. The more specialized the service, the costlier the dog. Specialized service means that more professional training went into the dog. These dogs can cost anywhere between $5,000 and $65,000. Some people may consider getting a dog on their own and training it themselves. Make sure you go through a professional training program with your German Shepherd to make sure he’s properly trained. Something else that goes into the cost of a dog is bloodlines. German Shepherd breeders that specialize in service dogs strive to produce outstanding dogs that will excel in that field. A quality bloodline is a foundation for training, so it’s important to ask questions (more on that below) of the breeder about how many of their dogs have successfully become service dogs. 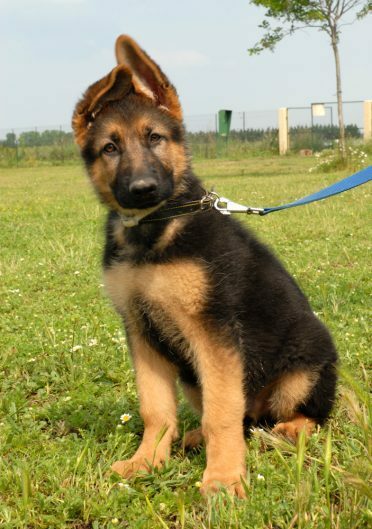 Buying a German Shepherd puppy from such a breeder to train yourself will cost around $2,000 – $7,000. Another thing that you need to consider before getting a service dog is the ongoing cost of dog ownership. For starters, you’ll want to feed your service dog a high-quality food that will allow them to live a long, healthy life. You also need to cover vet bills, whether it’s just yearly check-ups or for injuries or illnesses that could come up along the way. So, don’t forget to factor this into your budget. Training service dogs can be difficult. It requires expertise, patience, and a strong desire to do good in the world. There is a little financial gain to be had when training service dogs, but it is gratifying work to know how much you’re helping those in need. Socialize them. This is so important because a service dog needs to be prepared to do their job without being distracted by people. They shouldn’t be afraid of people or show aggressive towards them. Service dogs will also need to be properly socialized with dogs and other animals. Set goals. Make sure these goals are both attainable but challenging. As the dog achieves the goals you set, keep giving them new ones to reach for so they can continue to grow in their training. Be patient. While German Shepherds are intelligent, it will still take the time to learn everything that you’re trying to teach them. Be patient with them and willing to repeat lessons as often as they need to understand them. Be the Alpha. You need to step up from the moment your dog enters your home and present yourself as their leader. If you don’t, you will not only have a difficult time training them, but you will also risk them getting into a lot of trouble as they try to lead your family. Beyond that, you’ll just want to train your service dog using the same methods as any German Shepherd in training. Service dogs are meant to work. For that reason, you want to look for a breeder that focuses on the physical and mental abilities of their dogs rather than just their appearance. This is especially important when considering breeders in the United States as many of these dogs are part of a show line which features weak, sloped backs, and high incidences of hip dysplasia. Finding a good breeder can be difficult, but it’s not impossible. Require applications. This means that the breeder cares about their dogs enough to want to know exactly what type of home they’re getting. It can also signify they’re in high demand because of the high quality of their dogs. Knows the breed. They should know everything about the needs and temperament of the breed and be able to answer all of your questions about German Shepherds. Invites you into their home. You should be more than welcome to see where they house their dogs, the condition of their animals, and how they’re raised. A good breeder has nothing to hide. Is highly specialized. They offer only one or two dog breeds and know them well. Someone who owns too many dog breeds can’t possibly focus on building up each one well and could very well be running a puppy mill. A good breeder will also give you a written contract with requirements and a health guarantee. They’re willing to put the time into certifying their puppies as healthy and having written information on all of their animals because they genuinely care about each one. Here, we’ve gathered a list of some breeders you can start within your search for a great German Shepherd puppy that can be trained as a service dog. Each of these organizations has different qualifications you must meet if you’re going to get a service dog from them. Be sure to read through their information carefully and contact them with questions before filling out an application. Because there are so many people in need of service dogs and not enough dogs to meet the demand, there may be a long wait before you’re able to get your own one. A certified service dog has gone through proper training and can, therefore, wear a vest that identifies them as such. This vest allows them to have access to nearly anywhere their human can go, even places like restaurants or plain cabin where animals are not normally allowed. However, some people, who don’t own a service dog, want to take their pet dog with them everywhere, too. So, they purchase a service dog vest for them and take them wherever they want. This is illegal and can cause some huge problems. First and foremost, a dog that is not legitimately trained as a service dog could be a danger to other people or animals. Secondly, when a fake service dog misbehaves badly, it can cause store owners to ban all animals from their businesses, including legitimate service dogs. As important as it is to not put a vest on a dog that isn’t a service dog, you also need to identify a service dog as such. Putting your dog’s vest on signals to them it’s time to work and lets others know the dog is working. It may be difficult, but you’ll need to be prepared to ask other people to not distract your dog while they’re wearing their vest. This will allow your service dog to do their job, and could even save your life. Once you have had your German Shepherd certified as a service dog, you can purchase a vest for them. 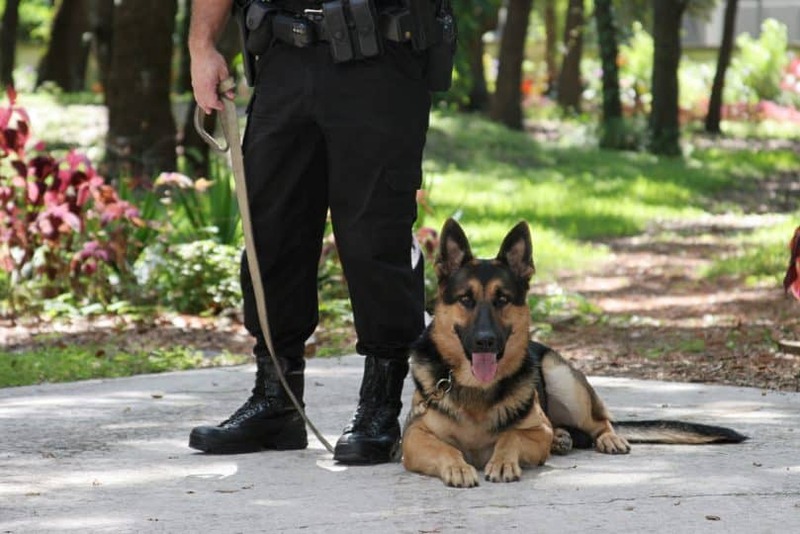 The average chest size of a German Shepherd is between 26 and 30 inches, so you’ll need the large size vest for them. When a service dog becomes too old or otherwise incapable of performing their duties, it’s time for them to retire. Depending on the dog and the family, service dog retirement can look very different. Some people may not be able to live without a service dog, so they will need to find a new home for their old dog to get a new service pal. Fortunately, there are people that are eager to provide a great home for a retired service dog. These dogs are so well-behaved that they make incredible pets. Other people may choose to allow their dog to live out their golden years with them. For most dogs and owners, this situation is ideal because they have spent a lifetime together. It can be extremely difficult for a dog to leave the family they loved. Even in retirement, it’s a good idea to give service dogs a job to do. This will help them live longer as they stay active, and keep them from getting bored. Visiting nursing homes or being read to by children are both great options for older service dogs. A German Shepherd is a hard-working breed that loves pleasing their owner and is so smart they can problem-solve on their own. These qualities and more make them outstanding service dogs for anyone that may need some extra assistance to lead a normal life. 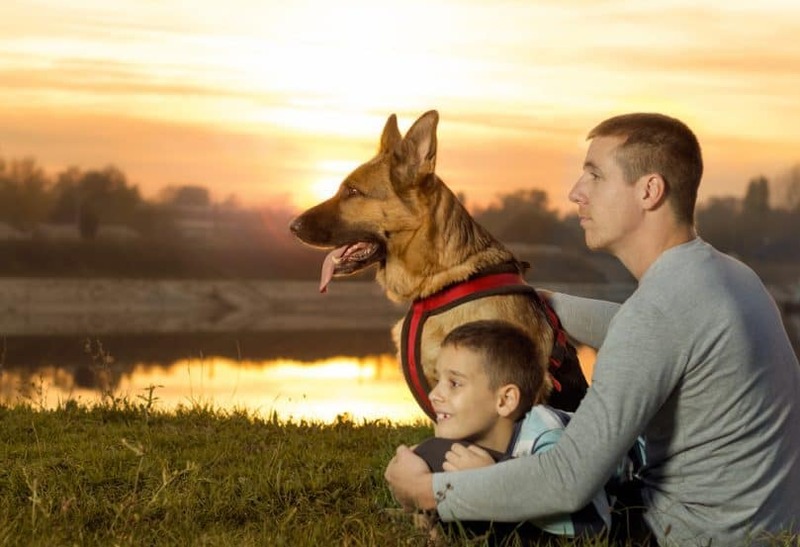 Whether you want one for yourself or your child, or simply looking for a way to make a difference in the world by training service dogs, the German Shepherd won’t disappoint.